Briarhills is a subdivision in western Houston, Texas. The Briarhills Property Owners Association (POA) and the Briarhills Home Owners Association (HOA) serve Briarhills, Meadowbriar, and Oaks of Parkway. In 2013 Faye Liu, a prospective homeowner quoted in a Houston Chronicle article, speculated that there were many employees at BP and Shell Oil Company who were buying houses quickly in Briarhills since they were able to pay with cash; these employees would be in the later stages of their careers. The community is in proximity to the intersection of Texas State Highway 6 and Briar Forest. Briarhills has 664 houses. Meadowbriar has about 125 houses. Oaks of Parkway has about 100 houses. Lakes of Parkway, Parkway Villages, retail developments, and restaurants are nearby. As of 1996 the housing sizes are 1,800 square feet (170 m2) to 3,400 square feet (320 m2). In 2003, the lot sizes ranged from 5,500 square feet (510 m2) to 16,000 square feet (1,500 m2). The first generation houses, which were constructed in the late 1970s, include contemporary house and patio houses. In 2003 Nancy Scott, a real estate agent of John Daugherty, Realtors West Houston, stated that these houses had "more-modern kitchens and baths than most houses had" in the late 1970s and that "they were very innovative in their designs". 1980s-built houses included traditional patio and "soft contemporary houses". Houses built in the early 1990s included two-story traditional brick houses. The 1990s houses were priced from $140,000 ($223649.48 according to inflation) to $200,000 ($319499.26 according to inflation), or beginning at $70 ($111.82 according to inflation) per square foot; these houses were more inexpensive compared to those in the nearby gated "Parkway" communities. A real estate agent quoted in a 1996 Chronicle article, Rita Tucker Wright, stated that she believed that the diversity in housing styles makes Briarhills "the most unusual neighborhood in the west side of Houston." As of 2003, according to Scott, the price range of the houses in Briarhills was $160,000 ($217916.06 with inflation) to $290,000 ($394972.87 with inflation). The community is within the Eldridge/West Oaks Super Neighborhood (SN17). Residents are in the Houston Independent School District. The zoned schools are Barbara Bush Elementary School, West Briar Middle School, and Westside High School. Residents zoned to Ashford, Askew, Bush, and Daily may attend Shadowbriar Elementary School's magnet program. Residents zoned to Westside may transfer to Lamar High School. 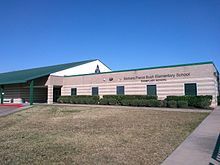 In 1996 Bush was ranked as an "Exemplary" school, and that year Katherine Feser of the Houston Chronicle stated it was a "selling point" of Briarhills. In 2003 Feser wrote that Bush "was a key factor in buying in the neighborhood" and that it was "highly rated". Bush opened in 1992. Westside opened in August 2000. West Briar, which was given a name combining those of Westheimer Road and Briar Forest, opened in 2002. Previously residents were zoned to Revere Middle School, and Wisdom High School (formerly Lee High School). Wisdom High School is over 10 miles (16 km) away from Briarhills. Grant Farris, a resident of Briarhills quoted in a 2003 Houston Chronicle article, stated that the openings of West Briar and Westside increased property values and increased cohesion in the community. The Houston Chronicle is the citywide newspaper. The Briarhills POA publishes the Briar Beat. Briarhills has basketball courts, a pool, tennis courts, and a 5-acre (2.0 ha) park. The park includes a clubhouse, and Meadowbriar and Oaks of Parkway residents share the facilities with Briarhills. The community is in proximity to Terry Hershey Park. The community has a swim team called "The Dolphins". ^ a b c d e f g h i Feser, Katherine. "Briarhills has wide selection of home styles." Houston Chronicle. Sunday, November 3, 1996. Business p. 10. Available from NewsBank, Record Number HSC11031378029. Available from the Houston Public Library website with a library card. ^ Feser, Katherine. "REAL ESTATE - Relocations - In a seller's market, hesitation can hurt - Couple having trouble making a purchase in a popular area where the supply is limited." Houston Chronicle. Sunday, April 14, 2013. Business p. 15. Available from NewsBank, Record Number 15276779. Available from the Houston Public Library website with a library card. "In their preferred neighborhood of Briarhills near Texas 6 and Briar Forest, they are losing out to employees in later stages of their careers at companies such as Shell Oil Co. and BP who can pay cash for a quicker closing, Liu speculated." ^ a b c d e f g h i Feser, Katherine. "Briarhills has older homes, modern touch." Houston Chronicle. Sunday, November 23, 2003. Business p. 6. Available from NewsBank, Record Number 3710427. Available from the Houston Public Library website with a library card. "The community, near Texas 6 and Briar Forest, is a shorter commute than from Katy, and taxes are substantially lower, says Farris, who takes the Metro Park & Ride downtown. The location is close to shopping, restaurants and the upscale gated communities of Parkway Villages." ^ "Maps" (Archive). Eldridge/West Oaks Super Neighborhood. Retrieved on May 12, 2014. ^ "HOA%20POA%20Map.bmp" (Archive). Briarhills POA/HOA. Retrieved on May 11, 2014. ^ "Bush Elementary Attendance Zone Archived 2013-12-28 at the Wayback Machine." Houston Independent School District. ^ "West Briar Middle Attendance Zone Archived 2012-02-08 at the Wayback Machine." Houston Independent School District. ^ "Westside High School Attendance Zone Archived 2014-04-07 at the Wayback Machine," Houston Independent School District. ^ "Energy Corridor Boundaries" (Archive). Houston Independent School District. Retrieved on March 18, 2016. ^ "Westside High School." Houston Independent School District. Retrieved on July 6, 2017. "Students zoned to this campus are eligible to apply for a Boundary Option Transfer to Lamar High School"
^ "Elementary Schools (A-J)" (Archive). Houston Independent School District. Retrieved on May 11, 2014. ^ "High Schools" (Archive). Houston Independent School District. Retrieved on May 11, 2014. ^ "Middle Schools" (Archive). Houston Independent School District. Retrieved on May 11, 2014. ^ "MID98.HTM" (). Houston Independent School District. December 14, 2001. Retrieved on May 11, 2014. ^ "HIGH98.HTM" (). Houston Independent School District. April 13, 2002. Retrieved on May 11, 2014. ^ The Briar Beat. Briarhills Property Owners Association, August 2013. Volume 1, Issue 4. p. 1 (Archive). Retrieved on May 12, 2014. ^ Wright, Billy. "Briarhills Dolphins Swim Team" (Archive). The Briar Beat. Briarhills Property Owners Association, August 2013. Volume 1, Issue 4. p. 5. Retrieved on May 12, 2014. This page was last edited on 25 August 2017, at 01:24 (UTC).